Looking to move to Alexandria in Virginia Beach? Great choice! 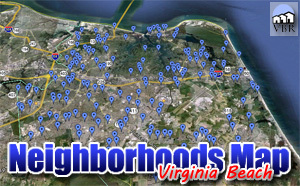 Here are Alexandria, Virginia Beach homes for sale! Alexandria is located near Kempsville Road and Centerville Turnpike. Most of the homes are 2 stories, but there are a couple of ranches. Access to Interstate 64 is down Centerville Turnpike to Indian River Road, north to i64. City View Park is a convenient walk away. The area is often called Woods Corner. Shopping is great! Wood Corner Shopping Center is right next to the neighborhood and has shopping, restaurants and nightlife. Other neighborhoods in the area are Brandon, Brigadoon and Charlestown. Alexandria is in the Tallwood High School Zone. We have a page with all the homes for sale in Alexandria. Click on this button to see everything currently listed there. When you find a home you would like to see, please let me know! Call (757)589-1237 and I will arrange a showing! Or, on the property, complete the Find Out More form and click submit. I will get information to you right away!